Rain, rain, go away! My baby wants to go out and play! Well, I guess its not so bad, the cold, rainy weather really motivates me to cook, and gives me more time to blog. I made this dish a while back, when things were a little too hectic to share it with everyone. I did manage to write it down and photograph it before it went into our bellies. This is an easy, impressive dish to cook for friends and family on those chilly winter nights. By the way, Trader Joe's is my favorite gnocchi, its already cooked, so you just throw it in a pot of boiling, salty water for a few minutes until it floats and you're ready to eat. ENJOY! In a large skillet, heat the olive oil and add garlic, rosemary and mushrooms. Cook on medium heat for 5-6 minutes until mushrooms are browned and water is evaporated. Add chicken and red bell pepper. Season with salt and pepper and continue to cook on medium heat for 7-10 minutes until chicken is browned and cooked through. Add tomato, marinara sauce, cream and sherry. Stir until combined, reduce heat to a low simmer and cook for another 5-10 minutes. Drop gnocchi into a large saucepan of boiling, salted water. 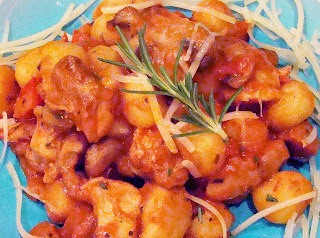 Gnocchi will float to the top when cooked, about 3-5 minutes. Remove gnocchi from water with a slotted spoon, add to the sauce. Stir to combine all ingredients. To serve: Plate 1/4 of the gnocchi mixture onto each plate, garnish with a rosemary sprig and finish by sprinkling 1/4 cup parmesan cheese around the edge of the plate.